Sponsors make The Spire Network, Spire Platform, and SpireConference possible. Unique access and contribution opportunities allow Spire Network Sponsors to provide resources and equipping to the full network of leaders across several access points. Whether it’s providing training or mentoring opportunities for leaders on The Spire Platform, providing special connection or training opportunities at SpireConference, equipping leaders with published resources or through publications like SpireLeader or exercising a position of influence to help grow congregations throughout the country through SpireInsights, Sponsors are champions of healthy, growing church and chief accelerators of the movement. Several sponsorship levels are available with a variety of opportunities for engagement. 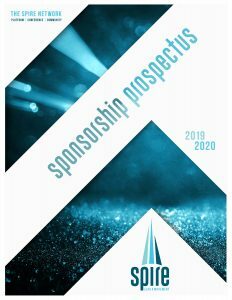 Please indicate your desire to receive a Sponsor Prospectus when signing up to be a Spire Partner or at the button below.